Danielle Rowden, expert digital solution architect, poses with the Greenbrier High School programming teams to celebrate their 'Most Improved' award. 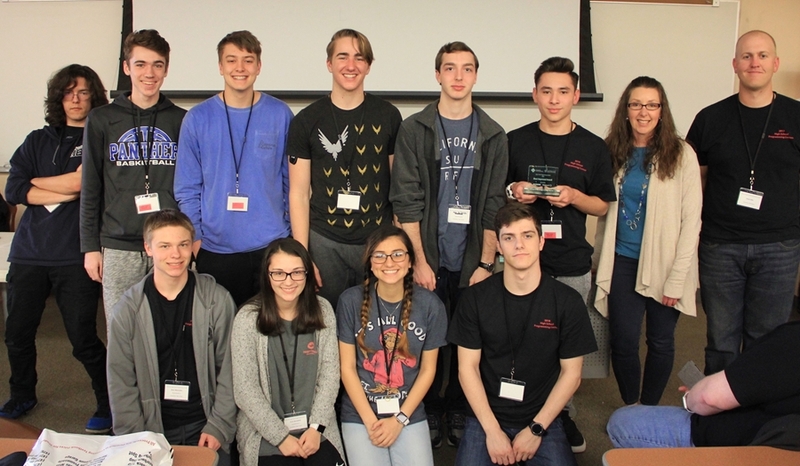 High school students from across Arkansas gathered in March at the University of Arkansas for the annual High School Programming Competition, hosted by the Computer Science and Computer Engineering Department. More than 60 teams of students squared off in a test of programming and problem-solving in the event, which is sponsored by Walmart, ACM and Acxiom. Professor Wing Ning Li, who leads the event for the Computer Science and Computer Engineering faculty, said the event is an opportunity to get high schoolers interested in programming while showing off the University of Arkansas. "The annual high school programming contest provides a platform for high school students to show case their talent in problem solving and computer programming," Li said. "It motivates students to learn computer programming and to work as a team. It also gives the students an opportunity to visit our beautiful campus and facilities." Li said the event, which has been running for more than two decades, encourages high school students to think critically about solving programming problems. "I enjoy supporting this event because it helps the high school students to see the beauty of algorithmic problem solving and programming, which has revolutionized everything for the past 60 years," he said. "Working with our alumni who volunteered to be the judge panel, our current students, departmental IT and office staff was fun as well. We had a wonderful team."